Navigator/communicator in one handy unit. Stay in touch, and on track with the Rino® 700 2-Way Radio/GPS Navigator. The rugged Rino navigator is your go-to for hunting, hiking, paddling—or any outing that packs in some adventure. Rino® 700 has the core functionality of more expensive models, but with a more affordable price that you'll love. 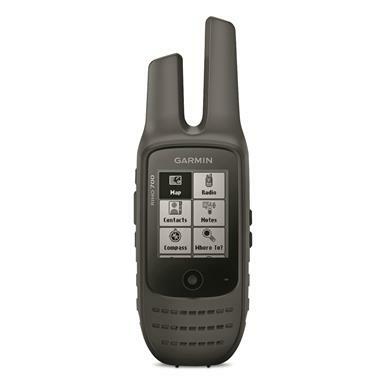 The powerful 2-way radio is fully compatible with others in Garmin® Rino® series, so it's easy to stay in touch with other Rino-carrying members within your group for up to 20 miles. And the high-sensitivity dual GPS/GLONASS receiver and quad helix antenna make it easy to pinpoint your exact position, even in heavy cover. Crisp 2.2" monochrome display is easy to read in any lighting. And the unit is easy to use with its thumbstick control operation. Ruggedly built and water-rated to IPX7. Keep tabs on your friends, hunting party or fellow adventurers in the field with Rino's unique position reporting capabilities. You can send your exact location to another Rino user, so they can see it on their map display. Or use position polling to request a position from another Rino device. You can even exchange unit-to-unit text messages with other Rino users in your area. Comes with built-in worldwide basemap with shaded relief. Dimensions: 2.38" x 7.02" x 1.74"